Couch to 5K- My Story. Sunday 26th June 2016: As I type it’s a summer Sunday afternoon and I’m having a quiet sit down after my busy morning. I can’t quite believe what I have achieved and it still hasn’t sunk in. To many of you, you probably think I’m overreacting or showing off about something which many people do day in day out. But if you had seen what I was like as a child and how difficult it was for me to achieve this little goal mentally and physically, then you won’t be so dismissive. 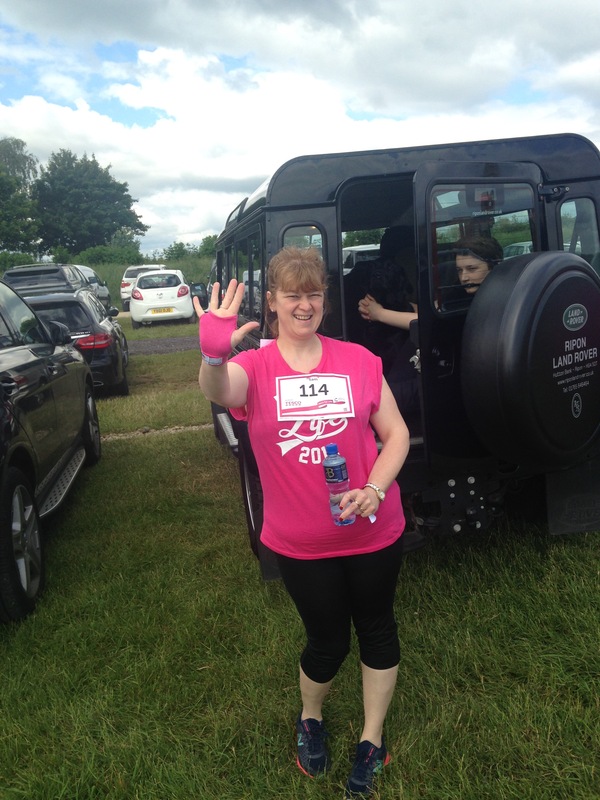 I took part in my very first Race For Life Event this morning in York and if someone had told me a year ago that I was to run in a 5K race, I would have laughed at them and said “Are you talking to me? I can’t run, my knees always hurt!” Or the other excuse was “I can’t even run for a bus!” How much has changed in a year. For those who regularly run half marathons or marathons, 5K doesn’t seem like much and nothing to talk about. But for me, Mrs Couch Potato who would prefer half an hour sat on the sofa watching the telly or doing cross stitch, to run anywhere is a huge step.So what made me go for it? I kept a little diary charting my progress or lack of it in some situations! A pre race selfie in my kitchen before we set off for the race. My race number and my back sign . 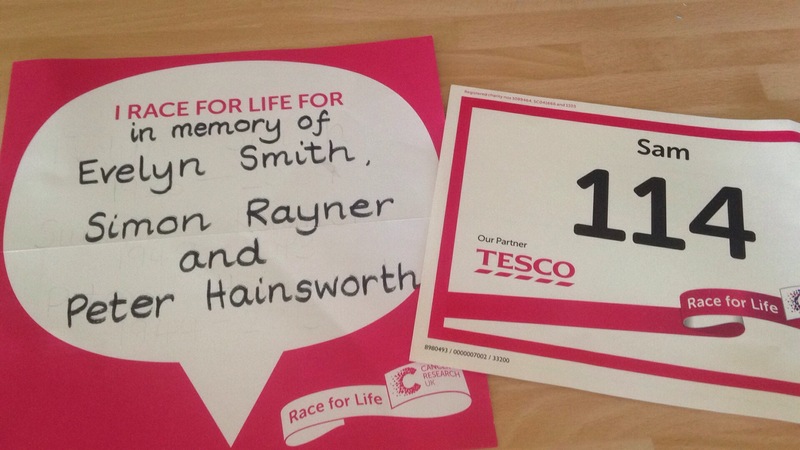 I ran the Race For Life in memory of my mother in law and two uncles. August 2015: I am feeling fat and unfit. I used to go to the gym and swim a bit on and off when I was in a getting fit mode when my kids were younger. I take my dog on long walks but I just feel I’m not getting enough exercise. I end up cancelling the gym membership I have as by the time I’ve finished work and done everything at home I’m shattered. What can I do which is free or fairly cheap and I can do without a long car journey anywhere? Several friends have been telling me about downloading the free NHS Couch to 5K app on their phones and had said how it had worked for them. I’m going to give it a try. I can’t run without my knees hurting and I know I’ll be out of breath within seconds. But what is there to lose? Let’s see what happens and I’ll take one session at a time. 30th August 2015: The next morning I tell my hubby and kids I’m going out running. Hubby says “Good for you,” and my kids start laughing at me. I don’t care, something has come over me. In years gone by if someone laughed at me or said I couldn’t do it, the seeds of doubt would be in my mind. But I keep thinking lets see how I get on. Session 1 starts off with a 5 minute brisk walk which gets me to nearly the other end of my village main street. I had said on Facebook I was going out running so I think can you imagine if local friends see this and then see me walking! Anyway, then it’s running time! It’s only for one minute but with the app playing and talking me through it, the minute was soon up and I was back to walking again. This was repeated 6 times. When I got back home I felt elated. I have only run for a total of 6 minutes but it was 6 more minutes than I’d ever run before in my life. I feel. like I’m on Cloud 9. I pass a mum I remember from my son’s primary school and she gives me encouragement, she’s doing the same but going in the opposite direction! I’m out of breath and my legs hurt but I did it! 5th September 2015: A couple of days later I’m out running again. My daughter says to me when I come back in “Have you been out running, you were walking back up the village and you’re not hot and sweaty” I. can’t believe her comment, once again I was doing my cool down 5 minute walk at the end! She thinks I haven’t been doing it properly! 9th September 2015: Its now taken me 2 weeks and a lot of huffing and puffing like the big bad wolf to get to the end of Week 1 of the Couch to 5K challenge but I’ve done it! 13th September 2105: Yippeee, I’ve finished day 1 of week 2, going at a snail’s pace heaving my bulk but getting there! One bloke shouts out of his car window as he drives past shouting “Run, Forrest, run!” at me! 17th September 2015: I ended up stopping for a couple of minutes as hubby drives past and sees me on his way home from work. He ends up talking to me but luckily having an app you can pause it. I feel great that now Day 2 of week 2 is completed. 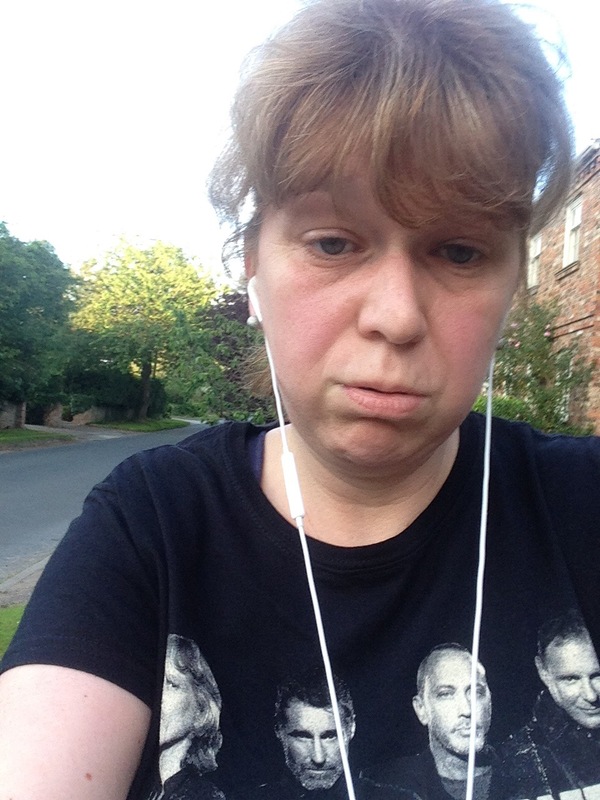 20th September 2015: I’m running a bit faster today and have now completed week 2 now, yayy! I meet a lovely couple walking past. The man says to me “the bus stop’s that way,” which gives me a giggle! 29th September 2015: Yayy! Getting easier each time! 4th October 2015: Struggling a bit today but at least I’ve completed week 3 now! 13th October 2015: Can’t believe I can now run for 5 minutes at a time, did 2 x 5 and 2 x 3 today. Feeling shattered but fantastic! 26th October 2015: I’ve done it! Sixteen minutes running in total again. At the end of the summer holidays I couldn’t run at all! Now look at me! 9th November 2015:Just realised week 4 has taken me nearly a month to complete. Just too much going on. Found it much easier this time, got a running playlist linked to my app now! Feeling fantastic. It really eggs me on having music to motivate me. Friends are very helpful with suggestions about what they have on their playlist! 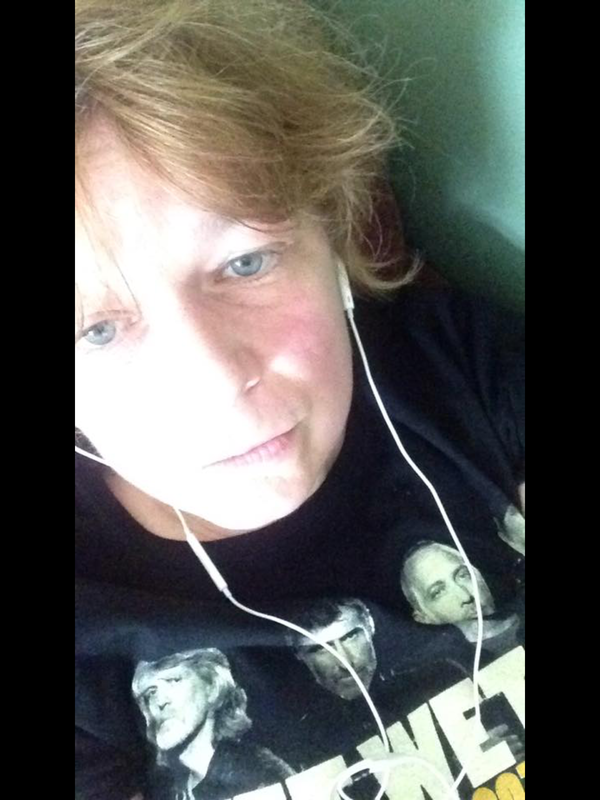 14th November 2015: Update on Facebook: ” I did it, so happy done day 1 of week 5 now. Ran 3 x 5 minutes. Really enjoyed my run today. Was laughing at a man going past on his bike. He shouted out “Want a ride on my bike?” It was tempting, lol! I feel focussed! I didn’t get much running done in the lead up to Christmas and New Year. So much going on and it didn’t stop raining. I kept thinking about going out running but one look at the miserable weather made me stay indoors! I get out for walks with the dog. Maybe the dog should come running with me but I don’t think running with a massive Labrador is a good idea! 17th January 2016: Yayy, i did two lots of 8 runs with 5 mins walking in between. I thought I’d be collapsing but I’m still here! 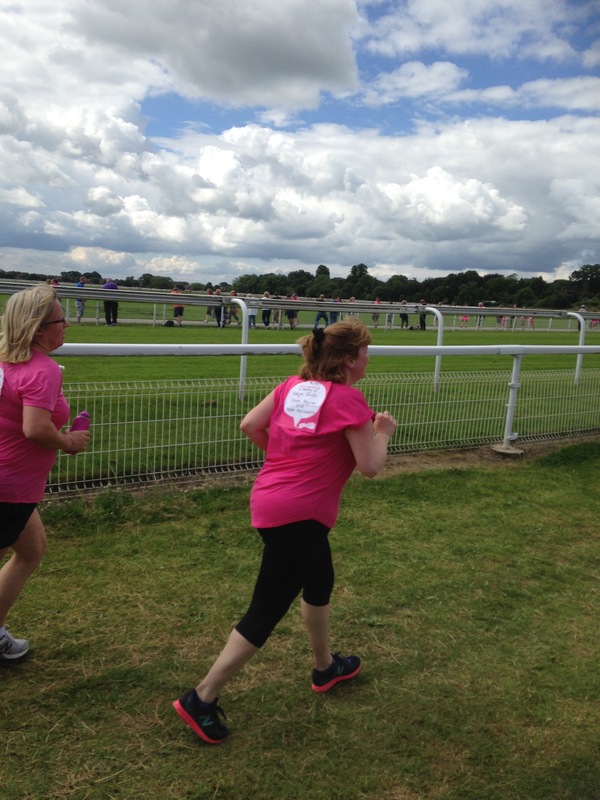 At the end of January I set myself a challenge to run in this year’s Race For Life in York. I have 6 months to sort myself out for raise some money for cancer research. Over the last few years I have lost my mother in law and two uncles to cancer. This is a way I can do something. I sign up and register for the race. 9th February 2016: A landmark achievement. I ran for 20 minutes WITHOUT STOPPING today! I’m still alive and I didn’t collapse with a heart attack! 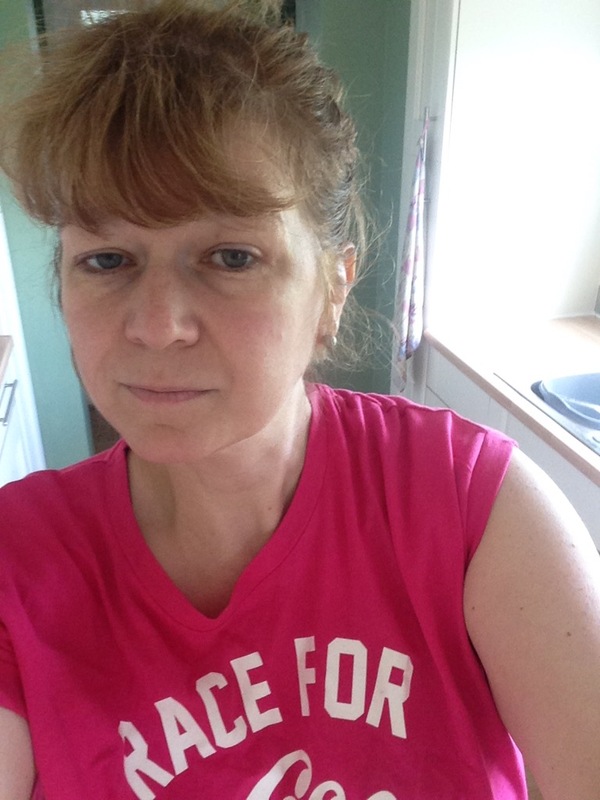 20th February 2016: Better get my act together for Race For Life . I run for a total of 16 minutes today, so pleased as I couldn’t run anywhere last year. I’m feeling so happy and proud right now. 27th February 2016: Week 6, day 1 just done. I’m getting there slowly. From a snail to a tortoise pace now! Another month goes by without running. I have a busy time with work and struggle to get out to run especially as it’s still dark quite early. I also end up with a chest infection so any exercise would wear me out. Even walking the dog makes me exhausted. 6 April 2016: Week 6 day 2 completed. I’m running at a snail’s pace today. First time I’ve been out since I had my chest infection. I have 12 weeks until the Race For Life, better get my act together! 16th April 2016: 25 mins non stop running in the wind today. Wish I could get myself faster though, still running like a snail. At least I can run though it’s very slow! I try to encourage my kids to come out with me but it doesn’t work out. 24th April 2016:Week 7 day 2 completed. Those. calf muscles are really aching today but I feel like it’s working. I try a different route and love pushing myself to run even further. 28th May 2016: First run I’ve had in a month because of yet another chest infection and a nasty cough. Not happy that while I’ve not been out runing the really reliable and user friendly NHS Change For Life Couch t0 5k app on my phone has been replaced by a crappy BBC one. Instead of the friendly Laura encouraging me through the headphones I have Sarah Millican telling me to run! Don’t get me wrong I like Sarah Millican but the appkeeps cutting out and crashing and won’t play my music properly. Judging by all the rubbish reviews on the App store I’m not the only one who thinks it’s crap! Despite this I put up with it and I feel fantastic. 3rd June 2016: Week 8 day 1 completed, 28 mins non- stop running today plus a wolf whistle from a guy in a passing car. Haven’t been whistled at for over 20 years though usually it’s being sarcastic. 8th June 2016: Just to prove I did do my run this morning I posted a selfie of me at home after I’d done the run. Couldn’t track my progress on the shite app but at least I feel fantastic. A running selfie to prove I went out even when the app crashed. 24th June 2016: No running for 2 weeks, have had such a busy couple of weeks at work and was away last weekend so never got out. It’s my last run before the Race for Life this Sunday. I do 5 minutes warm up, 30 mins run non stop and a 5 minutecool down. It’s still enough distance to cover 5K but I feel fantastic and am determined to give it my best shot on Sunday. Finally the day of Race for Life came. It was a warm day with patches of blue sky poking through the clouds. I was relieved it wasn’t too hot or it wasn’t chucking it down with rain. That would have made my first charity run harder. We got to York Racecourse in plenty of time and parked up. My husband, son and even the dog came to watch me and encourage me! 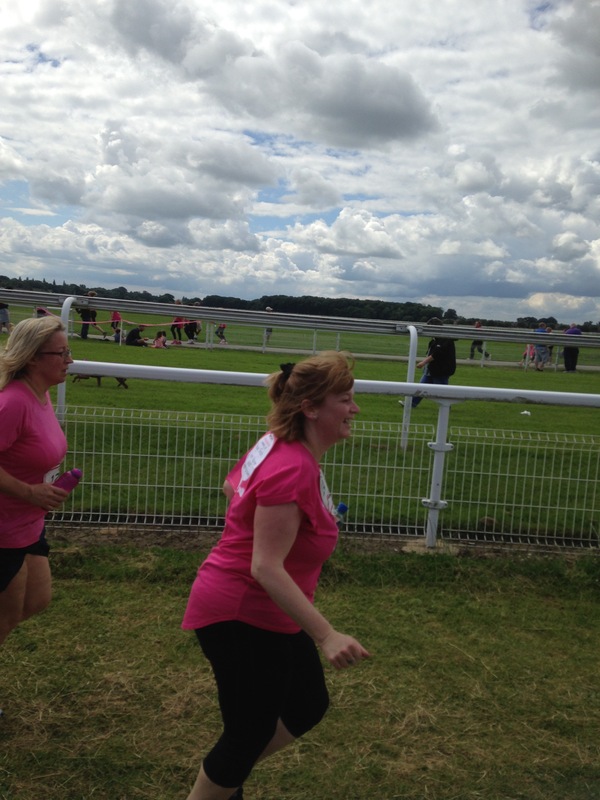 The Race For Life event was a great atmosphere. It really drove it home to me about how everyone there who was taking part was doing the race in memory of or to support cancer sufferers going through treatment at the moment. It was lovely to see children taking part as well as whole families. I wasn’t entering as part of a team but it made me think that I could do that another time. Once we were warmed up we were asked to make our way to the starting line. Runners went first, followed by joggers and then walkers. I thought I’d probably be running/ jogging. And then we were off on the dot of 11am! I felt all choked up seeing all the visions in pink around me all taking part together to do our bit to fight cancer. At first we were running on grass which was tough going for me. All my runs had been on hard surfaces and I wasn’t used to it. About 10 minutes in and I slowed right down. I felt like packing it in and just walking the rest of it. I thought of what people would think if I didn’t run it, so I had a massive gulp water and stayed at my slow jogging pace. We got nearly to a full circuit and I saw that the 10k runners had to go to the left, all the 5ks to the right. I didn’t know how far I’d run but I honestly didn’t know if I could carry on. Then we saw a couple of volunteers cheering us on with giant foam hands ready to high five us. Just seeing people clapping and cheering was a massive boost. Then I saw the boost and encouragement that made me realise I could do this. My husband and son were stood there cheering me on and I was suddenly filled with a burst of positive energy. Onto some Tarmac now which made all the difference. Surely it couldn’t be much further now. But then I saw a post saying 2k. Have I only run 2k? I thought. How much further? The remaining 3k or so was around the perimeter of the racecourse following the service road. I kept to my slow running pace although my calf muscles were beginning to ache like mad. What kept me going was to look out for the furlong markers around the racecourse. I kept thinking, now let’s run to the next furlong marker. Then I reached that, thinking let’s aim for the next one and the next. Eventually I had reached the 4K marker and it was the final bit. I was now back running on grass and could see the finishing line. I had never run in a race a before and words cannot describe how I felt seeing my family cheering me on. Doing something I thought I could never ever do in life after being teased and bullied at school for being rubbish at PE and for coming last in Sports Day running races. That moment was up there amongst the highlights in my life, from getting my teaching degree to getting married and giving birth to my two children. I will never ever forget that feeling. Running at snail speed as caught on camera by my husband. A big smile on my face knowing I was reaching the finishing line. So what next? Well I’ve decided I’m going to keep on running and aiming to run for longer distances. Friends have told me about local Parkruns so I am hoping to go along to one as soon as I get a free Saturday morning. Who’d have thought it, eh? Next Post Eton Mess Cake- The Clandestine Cake Club A Year Of Cake Bakealong June 2016.